The US recession 2020 and its impact on the globe has been in the news lately. Many economists believe in a 2020 recession prediction—that a recession may be around the corner. However, economists are divided on the next recession forecast. Some believe it will be during the early 2019 or 2020 while others believe it will be during the end of 2020. The U.S. economy has been growing for nearly a decade since the Great Recession. The country is expanding and experiencing one of the longest booms in history. Recessions are basically a period of economic slow-down. Poorly thought put investment strategies and credit agreements accrue and then cave in on themselves. This exerts a sudden financial pressure on businesses and individuals who made those poor credit decisions and investments, sending out a ripple effect on the economy. The added financial pressure forces companies to lay off its employees. With less and fewer people gainfully employed, the collective buying power goes down. This affects businesses adversely, as there are fewer people to buy their products and services. This in turn, leads them to let go of more employees—and so the cycle continues. 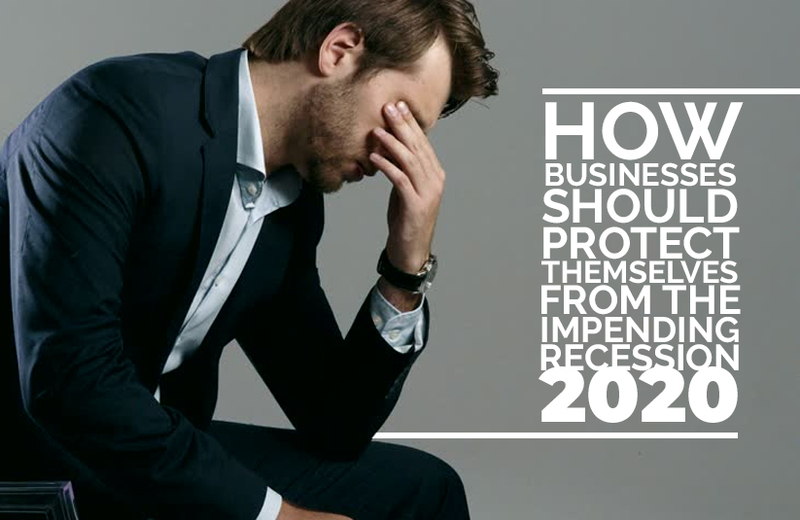 How Can I Prepare My Business for The Next Recession? Business protection is on top priority for everyone. It’s all in how you plan. There is a saying: failing to plan is planning to fail. As a business owner, business protection should be on your top list. The best thing you can do is craft an emergency plan, one which covers how to stay afloat in the recession period. Think about what you’ll need to do to put yourself in a position to competently implement your recession emergency plan when the actual recession strikes. But what should an emergency plan for recession look like? You will need to determine how to sustain your company if revenue gets tight and the going gets tough. Increase your line of credit while the economy is still in a good shape. This is possible to do when the economy is still healthy and isn’t experiencing any downturn. Slow your hiring process and stay away from making any new hires, as much as possible. This minimizes the necessity of layoffs. Think critically about the strategic changes that you would need to do to you to accommodate the same volume of clientele with slightly less manpower. Discuss increasing your current employees’ workloads—if possible. And avoid any discontent by increasing your employee’s salary. If the workload is doable and your strategies right, it may pay off during the recession. Also, salary bumps are often more affordable than constantly committing to pay another entire salary when the going gets tough. Diversify your service offerings. Offer various scope and service for the different price range. This way, if fewer clients are able to afford pricey deals, creating a new service offer that is more affordable may be a smart move. This would give you a new sales channel. Hence, you can avoid dependence on the constant flow of just one type of service, in case that flow suddenly comes to a standstill. Enter into partnerships, acquisitions, and agreements only after thoroughly considering every pros and con. Only enter those that allow you to cast a wider net. Reallocate funds for business growth strategically. Use a major chunk of your funds to enrich user experience. This strategy is failing proof, mainly because it helps ensure you will hang onto your current customer base which is your lifeline and unquestionably, your largest asset. Deliver what you promise your customers. A focused attention on your customers will pay you off during times of recession. This is one of the smartest moves you can make, especially in advance of a recession. Give emotionally positive experiences, show an effort to do things, give attention to detail and focus on product durability. This gives your customer a sense of unbridled trust in you as a service/product company. Invest wisely—choose your customers. Choose your stock options wisely—buy stock in AI and robotics-based companies, if you plan to invest. Set up an emergency savings account. This is basic business 101. Have at least six months of expenses saved up. Even if you already a lot in savings, make sure part of it is liquid and you can access it any time. Make sure you have some cash in your savings accounts. Manage your risk by taking these measures. Investing your funds wisely will help you stay afloat during the recession. If you need help, choose to invest in a business consultant company. Plan for the long-term. With a strong strategy in place, you may find that the next recession is nothing but a glitch. Ourbusinessladder is a Business Consultant Company in India, specializing in business advisory and market research. We are also one of the leading Market Research Company in India. We have helped several startups gain ground and helped established businesses turn their game around.